This week, the next chapter in the Star Wars saga finally hits screens. There’s excitement in the air, but before we dive into the new, we at io9 decided to glance back a couple of years and reminisce about The Force Awakens, the movie that kicked off this new trilogy, and what it still means to us going into The Last Jedi. 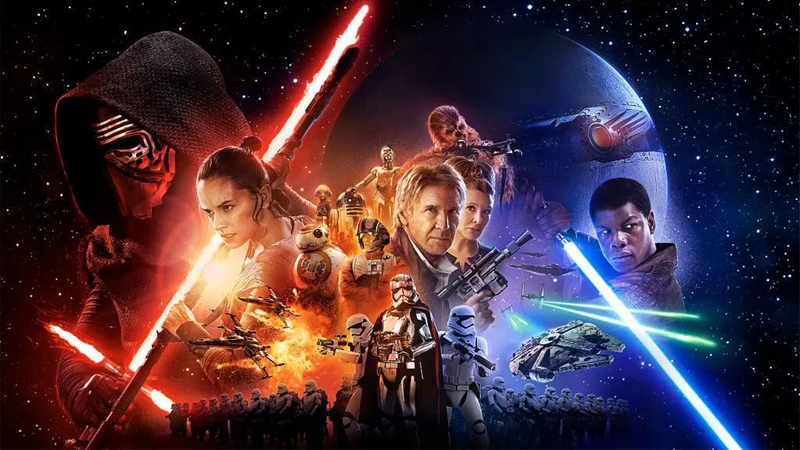 When The Force Awakens opened December 18, 2015, it gave us a brand new chapter in Star Wars, opening up a whole new worlds of opportunity, reuniting us with beloved characters, and introducing us to the next generation of heroes. But a lot has happened in the last few years, so I gathered Germain Lussier, Jill Pantozzi, and Evan Narcisse to rewatch the film and look back on what’s stuck with us (and what hasn’t) now that we’re about to return to the galaxy far, far away. James Whitbrook: Evan, Germain, Jill, I want you to cast your minds back to a long time ago (or two years) in a galaxy not that far away—December 2015, when The Force Awakens first came out. When did you first see it, and what was your original reaction? Jill Pantozzi: First of all, I can’t believe how it feels like both AGES since it was released but now, on the eve of The Last Jedi, like almost no time at all. I saw it opening night, or the night before opening night technically. I was buzzing. Evan Narcisse: I saw it at a press screening before it opened and I really, really liked it. The clearest critical memory I have was wondering at how TFA played with these character archetypes Lucasfilm knew we were expecting. Germain Lussier: I was lucky. I got to see it at the world premiere in Hollywood, with J.J. Abrams, George Lucas, and the entire cast and crew in the room. I was sitting behind Geena Davis with Zach Braff next to me. It was that kind of night. James: Damn, Germain’s here showing us all up. Germain: The whole thing was kind of a blur though because I had been so, so hyped for it. And afterward, I admit, I was conflicted, because I’d been waiting for so long for the movie, walked in so hyped for the movie, and I had every spoiler in my head. So the movie was kind of like cutting out the weeds to find the grass. And once I had the story in my head, I liked it, but it was hard to say if I loved it. I wasn’t until I saw it again, no preconceptions, that I loved it. James: See, you guys were lucky—I’d opted to wait till the weekend after it had come out in the middle of that week, to see it with friends. It was an unbearable wait, trying to avoid spoilers or avoid everyone else here freaking out about it in the io9 Slack for that week, but worth it to see it with friends instead of getting myself into the first screening I could. It was something that made that first viewing all the more emotional for me, because I can cry like a big baby at anything, but seeing it with friends for the first time rather than “for work” made it really special, and I fell in love with the movie upon first viewing. Jill: I was surprisingly happy with it on my first go. I was worried I’d hyped it too much and it wouldn’t be able to meet those expectations but it blew me away. The cast was so wonderful and dynamic and charming. And hoping against hope that Rey would turn out to be a Jedi, and then have that come true, had me in tears in the theater. Evan: See, I felt robbed at Finn not being a Jedi! Jill: I know it might have meant something drastically different to me sitting there and seeing her grab that lightsaber, it had been a long time coming for some of us female fans, to see something like that. Evan: But, ultimately, I liked him for who he was. Jill: Yeah, I was hoping they both would be. James: Poor Finn, baiting and switching with that lightsaber. He still does a pretty decent job with it, though. Germain: He gets sliced and diced! But “Come and get it” is one of my favorite moments in the movie. Evan: As I was alluding to before, TFA keeps you guessing as to who’s going to be the Han, Luke, Leia of this movie. It seemed like they all had that hustler/outlaw thing going to varying degrees. Looking back on it now, it all seems obvious, but it wasn’t then. Germain: That’s the crazy part about walking into these new movies, starting with Force Awakens. Unlike going in to see something else, these movies are a new chapter in a story we’ve been following for decades. That permanence is kind of intimidating. James: Speaking of that, and having re-watched the movie now on the eve of The Last Jedi, have your thoughts changed on Force Awakens since you first saw it? Jill: I’d say mine haven’t changed all that much. I loved it the first time, saw it two more times in theaters and have rewatched it several times since I got it at home. It is such a genuinely great story, I never get tired of it. Germain: I’d say it’s remained pretty steady after that first viewing. The first viewing was unique and complex and emotional. Once I just watched it as a movie, a Star Wars movie, I fell in love with it and still love it today. No, it doesn’t have the same impact on viewing 15 as it did on viewing two, but I still laugh at my favorite lines and make sure I’m on the edge of my seat for the big moments. James: I think I’m in the same boat, Jill, in that it’s become a go-to comfort movie—I can put it on and cheer myself up in an instant, and a lot of the moments that made me emotional the first time I saw it still get me now. I think the only thing that’s really changed is I appreciate just how well it sets up Rey’s background and capability in the early stages while still treating her as this relatively mysterious cipher. You can see the groundwork for all the things that eventually culminate for her being subtly laid. She has, I think, by far the strongest arc in the movie, and I find myself appreciating that more the more I watch it. Evan: The thing that strikes me on re-watching TFA is how strong all the acting performances are, especially coming off the prequels. There’s so much expressiveness in this movie. It’s easier to believe the characters have stakes in the plot when their performances are good. Like, when Finn whips off that helmet, you can feel the panic. He needs to get out of the First Order. Jill: Yes! It’s easy to love them all right away. Germain: Daisy Ridley’s cute awkwardness when she says “I’ve never met a Resistance fighter before” or putting on the X-Wing helmet. Like, you can’t help but love her. Jill: Oh god, the helmet! One of my favorite parts. James: Speaking of acting, we don’t actually get to see him all that all that much, but I actually think Adam Driver is fantastic as Kylo Ren in this movie. It’s such a fascinating role, a villain who’s not quite altogether, yet unlike Vader, Maul, Dooku, and Palpatine before him, there’s such a raw, emotional streak to his performance that even when he’s got the mask on, you can feel the rage radiating off him. Jill: Adam Driver is actually one of my least favorite things about the film. I think he does a good job as Kylo but I can’t see past his Girls role. James: I know a lot of people who’ve said that the minute Kylo’s mask came off they couldn’t be scared of him any more, or that it diminished him as a villain, but that totally worked for me. I’ve never seen Girls, so it wasn’t that, but there’s a vulnerability to him when he takes the mask off that makes me so fascinated by Kylo Ren as a character. The fact that he’s this untamed, roiling sea of conflict, still finding his way in the Force and still testing himself, honestly makes him such a promising and surprising villain for me. James: Hahaha. Ben Solo has no time for love; he’s too busy slashing his room up and listening to whatever the Star Wars equivalent of My Chemical Romance is. But speaking of things we don’t like—is there anything that still rankles you about the movie now that we’ve all seen it so many times? Evan: I still hate that it’s another orbiting death ray as the main threat. Germain: As for the question of things that still bug me—I guess I still never feel truly heartbroken by the death of Han Solo. That relationship is criminally underdeveloped and by the time we get to that moment, it plays out in an interesting way, but it’s not as impactful as even, like, the death of Yoda. Germain: No one cries when Han Solo dies and we should. We should bawl. Jill: They spent a bit too much time reminding us he’s an adventurer, and not enough of a regular guy. James: Han’s death never gets me—but Leia’s reaction to it always does. But I think that’s because, and apologies to Noted Han Solo Fan Germain in advance, I never really liked Han as much as I did Luke and Leia as a kid. I think that’s why her sensing it, specifically, is what makes that scene so emotional for me. Germain: I’M OUTTA HERE. But no, I like Leia’s reaction too, and her and Rey at the end. The not hugging Chewie thing bugs me but even J.J. admits that was a mistake. James: But speaking of things that still disappoint me—I’m with Evan that I think Starkiller as a threat is just returning to the same well too many times, but on another level, I just think that the battle to destroy it is not all that great. James: I am a big, big fan of X-Wings, and starfighter combat in these movies in general, that I was so disappointed that Poe and the rest of the pilots get so little action and time to shine in those final moments. When you’re basically re-doing the Death Star Assault from A New Hope and you don’t have a damn good space battle to go with it, you messed up. And it’s a shame especially because I think the earlier scenes on Takodana when the Resistance come flying in are so good. Germain: Oh man, SO good. “That’s one hell of a pilot” is one of the top five moments in the movie for me. Maybe top three. James: There’s an extended shot in there where Finn sees Poe’s X-Wing, and he doesn’t know it’s him, but we just watch this one long shot from his perspective on the ground of Poe swirling through the air, and he takes out something ridiculously like, 10 TIE Fighters in about 20 seconds, and it might be one of my favorite shots in the movie. There’s nothing like that in the final battle sequence for the starfighter stuff, and as someone who loves that, I was really disappointed. Jill: Okay, I just need to admit something WILD that went through my brain when we see Poe return in that scene. I thought... the Resistance had started using clones and all the planes would be filled with Poes. James: I mean, they should. Jill: Just... all the Poes. James: Because THAT DUDE TOOK OUT OVER 10 FIGHTERS IN 20 SECONDS. Clone him and have unparalleled air superiority forever. Okay, we did things we dislike. Ithere anything that you love more about the movie now that you’ve re-watched it a bunch? James: I am definitely with Jill in that BB-8 still fills me with glee whenever I see him. Jill: More every day, Hahahaha. BB-8 is the MOST PRECIOUS new creation in years and I’m so happy he exists and has feelings. Germain: I like Maz Kanata now more than I did the first time. She’s mostly pointless but I find her super funny. Like, don’t love. I went from dislike to like. Evan: I love Boyega’s performance. He mixes fear and braggadocio SO well. And I think Kylo Ren is one of the most compelling movie villains in years. Jill: I would also add the scene with a wounded Chewbacca and Major Harter Kalonia. I can’t get enough. Germain: Yeah, there are so many perfect little side moments. Jill: So short, so great. Evan: Man, the scene where Kylo is throwing his tantrum and the stormtroopers turn around... gold. James: Hard agree, Evan. Also, I wanted to ask, there’s two unfortunate bits of context that re-shape watching this movie after the first time, especially now before The Last Jedi. First, now we know it’s Han’s last appearance (well, Solo: A Star Wars Story aside), and secondly, re-watching it in the wake of Carrie Fisher’s passing late last year. Have either of those changed how you experience the movie now? Jill: When I rewatched it in advance of The Last Jedi I lost it with Carrie came on screen. That won’t stop for a while. She means so much to me as a person, putting aside the classic character, it’s rough. Germain: I think I will always hold the same reverence and nostalgia for those characters whenever I see them no matter what happens outside of these movies. So no, it doesn’t change it much for me, but I still get choked up when the reunite or when Han gets back on the Falcon. Almost anything they do gets me in the feels. James: For me, like I said earlier, Han was never my favorite of the original trio, so while I think his death works, especially for Kylo’s story, it doesn’t necessarily bother me that this is his last outing. But like you Jill, this was the first time I’d rewatched the movie since Carrie had died, and I couldn’t stop gushing tears the first time she stepped out of that transport ship on Takodana. I can, and have, re-watched the original trilogy since, and it doesn’t effect me as much—but I think because this one is so much more recent, it hit me really, really hard that she was gone. It was a lot tougher to watch her say goodbye to Han when he leaves for Starkiller than I was expecting. What about you, Evan? Evan: I’m a big Han Solo fan and loved the idea that he was a terrible father because he’s a smuggler and a scoundrel. I agree that it was underdeveloped, but it still shocked me. Re-watching this after Carrie Fisher’s death was hard, because the character shift into General Leia kind of parallels Carrie Fisher’s own life story: This is a woman who’s fought hard and won a certain amount of wisdom and maturity. Yes, that interpretation bridges reality and fiction but my brain goes there because of Star Wars’ power to inspire us. If Carrie Fisher can be open about her life turbulence and still show up as General Leia in all her vulnerability and glory, maybe we can, too. James: Agreed. At least having watched Force Awakens again I’ve got myself prepared for the inevitable heavy sobbing I’ll do watching The Last Jedi for the first time. Germain: Or so you think. Jill: Haha, I think it’s safe to say. James: Germain, I cried at the opening titles for The Force Awakens the first time I saw it. Safe to say I will absolutely find something to cry about this time! Germain: Oh, I cry at commercials for The Last Jedi, I get it. James: Speaking of which, a final quick question for you all—one that might be a little tougher for Germain and Evan to answer, given that they’ve been lucky enough to have already seen it. But did re-watching The Force Awakens now that The Last Jedi is so imminently upon us change your expectations for the new movie? Jill: Considering how I got myself in knots last time, I’m trying to manage my expectations better. Every time a commercial comes on I have to turn it off because I’ll start bouncing. So rewatching recently was more preparation and general enjoyment. James: I think for me, it definitely raised expectations for what I want out of The Last Jedi. Re-watching was a really good, refreshing reminder that there’s so much promise in these new characters, especially Rey and Kylo Ren, that Force Awakens leaves the ground wide open for Last Jedi to follow up on. It made me realize that I can’t wait to see where Johnson takes these characters and these strands of stories next, and it’s unbearably exciting. Germain: I feel like rewatching The Force Awakens before The Last Jedi just got me excited for answers. I’ve seen it so many times and it’s so ingrained in my head over the past two years, I just kept watching and thinking “Maybe we’ll find out about that finally” and “Maybe we’ll find out about that finally.” It just got me more excited for the possibilities of The Last Jedi. Jill: I’m excited for the next chapter. James: Me too. At least it’s not that long until Jill and I get to see it!